182 pages | 14 B/W Illus. When it comes to climate change, the greatest difficulty we face is that we do not know the likely degree of change or its cost, which means that environmental policy decisions have to be made under uncertainty. 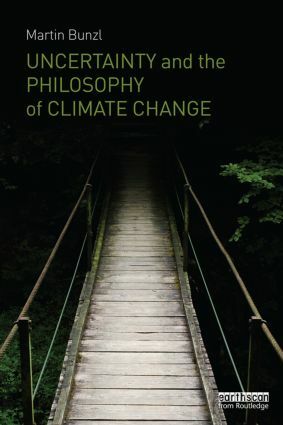 This book offers an accessible philosophical treatment of the broad range of ethical and policy challenges posed by climate change uncertainty. Drawing on both the philosophy of science and ethics, Martin Bunzl shows how tackling climate change revolves around weighing up our interests now against those of future generations, which requires that we examine our assumptions about the value of present costs versus future benefits. In an engaging, conversational style, Bunzl looks at questions such as our responsibility towards non-human life, the interests of the developing and developed worlds, and how the circumstances of poverty shape the perception of risk, ultimate developing and defending a view of humanity and its place in the world that makes sense of our duty to Nature without treating it as a rights bearer. This book will be of interest to students and scholars of environmental studies, philosophy, politics and sociology as well as policy makers. Martin Bunzl brings philosophy out of the ivory tower and into our everyday lives. What responsibility do I have to my future self, 20 years from now? What responsibility do we, as a society, have to future generations and the natural environment? Bunzl compellingly makes the case that an understanding of philosophic issues is central to successfully addressing the most important question of our lives: How to live well in a world where our actions can inflict (or at least not alleviate) hardship and suffering on others? Martin Bunzl takes the idea of climate change as a risk management problem seriously. In a book that is personal, as well as philosophically, politically, and scientifically well-informed, he asks us to see the challenge of climate change in collective terms. Our future is dark, according to the author, unless we can overcome our individualism and parochial concerns. Martin Bunzl is Professor of Philosophy at Rutgers University, USA, where he founded the Rutgers Initiative on Climate and Social Policy.